"For at least a decade, it has been a tradition this time of year. 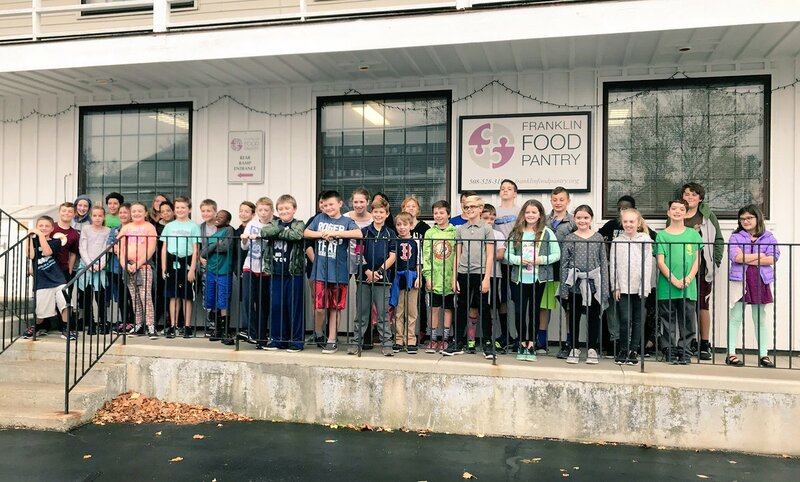 With Thanksgiving approaching, the fifth-graders at Davis Thayer Elementary School hoist bags and boxes full of donated food and household items and make a short jaunt - a parade of cheerful and excited good will - over to the Franklin Food Pantry. On Monday morning, this year’s class took their turn at keeping the tradition going - a charitable campaign the students said they look forward to as they work toward their final elementary school year. The delivery of the goods is the culmination of a few weeks of collecting donations from the school community, with students in kindergarten up to fifth grade gradually amassing their contributions until it is time for the fifth grade walk to the pantry. “I like how we get to walk over to the food pantry, and help people,” said Devin Curley, sitting at a table in the school cafeteria Monday morning, bag full of non-perishables dangling from his hands as he waited for the signal to line up and begin the procession." “We’re all back!” exclaimed the woman pushing two carriages as she ferried five cherry-cheeked children down the corridor on the lower level of the Franklin Public Library on Monday morning. The exuberant greeting brought an even wider grin to the face of Director Felicia Oti - a feat, considering how widely she was already smiling - as she navigated the small crowd moving from a program room following the “Move Along” story time. “And we are so happy to see you!” she responded.